You don't have to throw lavish parties to find a recipe like this useful. These beautiful little treats are just right for whipping up when friends come over for drinks, to serve as a quick, nibbly starter at a dinner party or to bring to a potluck where you are a guest. Because they aren't hot, they are an ideal choice to set out for people to nibble on as and when they arrive or need a little snack and there's no bothering with pulling them out of the oven at the right time or trying to keep them hot. 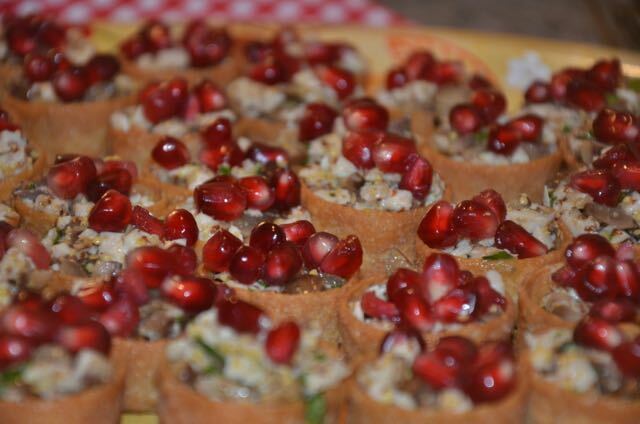 I particularly love these croustades because they only take a few minutes to put together and they look great, not to mention that the bright red pop of the pomegranate seeds is perfectly festive during the Christmas holidays party season. That said, I wouldn't be shy about serving these anytime of year... They're a beautiful little crowd pleaser! Depending on the size of the croustade cases you use, you may find that you have some leftover chicken & chestnut mixture. I would suggest either filling additional croustade cases with the mix if you are entertaining enough people to eat them, however you could use the leftover mixture to make wrap sandwiches. Simply fill wraps with the mixture and top with some leafy greens if you like and some pomegranate seeds or even a bit of cranberry sauce for a nice lunch! 1. Melt the butter and using a pastry brush, coat the insides of the croustade cases. This keeps the cases from getting soggy with the cold mixture and can be done up to 4 hours in advance of filling the cases. Once coated, set aside until you're ready to fill them. 2. Add the chicken, chestnuts, parsley, mustard, vinegar and oil to a mixing bowl and stir to mix well. Salt and pepper to taste, but be careful not to salt too heavily if you're using salted butter to coat the croustades. 3. Use a small spoon to fill the croustade cases with the mixture. 4. 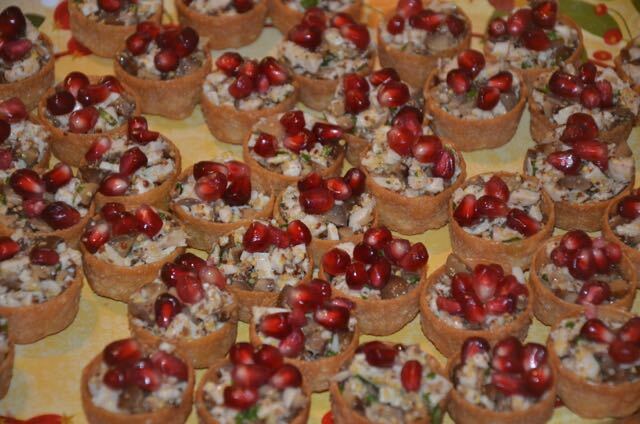 Sprinkle each case with a few pomegranate seeds.